Staddlestones were originally used as far back as the 16th century to support wooden storage barns above the ground to prevent mice from eating the grain stored there. 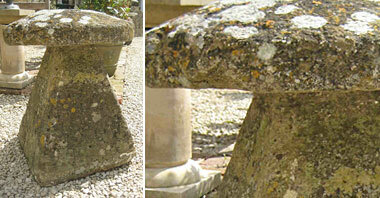 The base of barn would literally sit on however many staddlestones were necessary to keep it balanced. 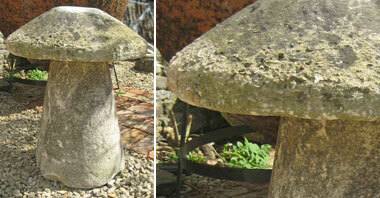 The most collectable staddlestones are well-weathered with beautiful patina. Prices depend on their size, age and the type of stone. Stone troughs were as well used in France as they were in Britain. They would stand alone to collect rain water, or could be sited next to a manual pump. They come in all shapes and depths. and include the D shape or bow-fronted style with its flat back making it ideal to sit against a house wall. As well as their original use as water troughs, they make beautiful planters and garden features in their own right.